Introducing our new Rizo bar! Crispy puffed organic brown rice smothered in our softest chewy creamy toffee, all covered in dairy-free ‘milky’ chocolate. A seriously yummy, crispy chew! 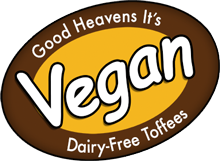 Dairy-free chocolate, sugar, glucose syrup, vegetable margarine (contains sunflower oil, vegetable oils), puffed organic brown rice, soya milk, golden syrup, soya powder, salt, lecithin (soya), vanilla. Chocolate contains: 42% cocoa, sugar, cocoa butter, soya flour, sunflower lecithin.